NIGERIA's Super Eagles will beat the Desert Warriors of Algeria when both teams meet in Saturday's crucial 2018 World Cup qualifier in Uyo. I don't know what the score line will be, but Nigeria will win! I am sure that opening statement is what 170 million Nigerian soccer fans want to hear, but which very few, if any, are willing to stick their necks out for. Well, I have stuck my neck out for the Super Eagles here and now. I am willing to take the risk of having my neck metaphorically chopped off. That is how desperate I am that the Eagles should come out victorious. Naturally, the question on the reader's mind should be what gives me the confidence to make such an audacious prediction? Did God speak to me as some are wont to claim or did I see a vision in a dream? Did I visit a herbalist or did Octopus Paul resurrect in a crystal ball in my garden? Answer: None of the above. So, how come I am making such a “reckless” prediction, knowing full well that our opponents Algeria are the number one ranked country in Africa at the moment; that they were Africa's best team at the last World Cup in Brazil 2014; that they currently parade some of the best African players in some of the top leagues in Europe; that the majority of their team are French-born players who have benefited from France's youth academy system to horn their skills and tactical discipline; that Algeria have always been a handful for the Eagles even at the best of times for Nigeria; that they are coming to Uyo very hungry and very angry having dropped points at home to Cameroun in their first 2018 World Cup qualifier and are desperate to quickly make up lost ground? On the flip side, how come I am saying the Eagles WILL win when Nigeria's Man of the Match in the win over Zambia in our first game, goalkeeper Carl Ikeme will be missing against Algeria; when our captain John Mikel Obi has been inactive at Chelsea; when our coach Gernot Rohr is only now trying out new players to plug our leaky defence; when we are unsure which type of Ahmed Musa will turn up-the clinical one or the poor ball crosser; when we are not sure how Uyo fans will react if the Algerians out-play our Super Eagles; when we are uncertain whether the Nigeria Football Federation (NFF) will have the player's camp allowances and bonuses ready! In the face of all the Algerian strengths and all of Nigeria's shortcomings, how come I am predicting that Super Eagles will win? Simply answer: Because I WANT it and I believe the Eagles have the talent to do it. That is why Nigeria will win! Whether I will get my wish – and I believe, the wish of all Nigerians – does not depend directly on me, however. Obviously, it depends on the Super Eagles themselves. It depends on Rohr, on goalkeepers Dan Akpeyi or Ikechukwu Ezenwa; on defenders Leon Balogun and William Troost-Ekong; on midfielders Mikel, Ogenyi Onazi, Victor Moses; Uche Agbo, Oghenekaro Etebo, et al; on the strikers Odion Ighalo, Kelechi Iheanacho, Alex Iwobi, et al. If the Eagles WANT to win as badly as I want it, I repeat, they will win! It won't be the first time that Nigeria will be pulling off a victory by sheer force of will. History is replete with occasions when the Eagles found themselves facing formidable foes but came out triumphant. I will only recall a few instances to inspire the present team. Incidentally, one of those occasions was against our current foes Algeria. The game was a World Cup qualifier for USA '94. 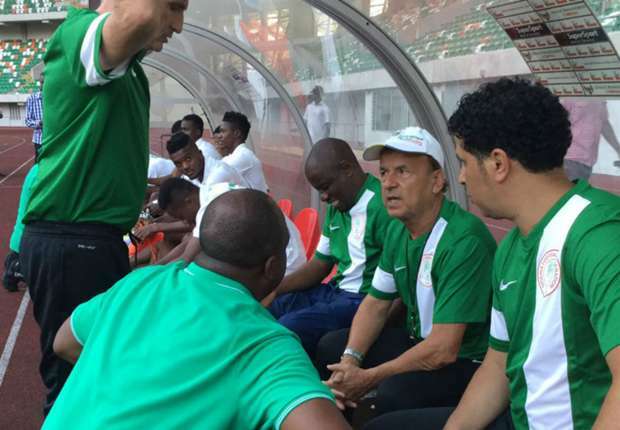 In a three-team round robin series, the Eagles had lost her first game 2-1 to Cote d'Ivoire in Abidjan, so they were under pressure to win their next game against Algeria in Lagos. Algeria scored first to heighten the pressure but because the Eagles wanted to win so badly, they fought back to win 4-1. I saw the highlights of that game on YouTube again last week. Super Eagles media officer Toyin Ibitoye may want to share the video with the players just to motivate them. The free-kick equalizer by Austin Okocha and the shot from a tight corner by Late Rashidi Yekini for 3-1 were some of the best goals ever scored at the National Stadium in Lagos. If Moses and Iheanacho are ready to emulate Okocha and Yekini at the Godswill Akpabio Stadium on November 12, Nigeria will win. Nigeria faced South Africa in the semi-final of the 2000 Africa Cup of Nations co-hosted by Nigeria and Ghana. The Eagles were under pressure having just managed to scrap a 1-0 win over Morocco which caused Lagos fans to hold them hostage. But against Bafana Bafana, coach Jo Bonfrere moved pacy right winger Tijani Babangida to the left side of the Eagles attack and the player responded by scoring two quick first half goals to seal the win. It is a common tactic nowadays for right footed players to play from the left wing and vice versa (e.g Cristiano Ronaldo, Gareth Bale, Neymar, Arjen Robben, et al). But it was still a novelty when Bonfrere deployed it back then. Before the South Africans adjusted to the strategy, Nigeria had won the game. If Gernot Rohr can unfold a tactical master plan like Bonfrere in Uyo on November 12, Nigeria will win. Nigeria was in danger of elimination from the 2002 World Cup qualifiers. Bonfrere had been sacked and the late Shaibu Amodu and Stephen Keshi had taken over as coach and assistant coach. Sudan had secured a draw in the first leg in Lagos and were primed to finish Nigeria off in the return leg in Omdurman. Against all the odds, (harsh weather, bad pitch and a hostile crowd), the Eagles won comprehensively, recording Nigeria's best away win (4-0) in World Cup qualifying history with Yakubu Aiyegbeni scoring two of the goals. Keshi told me later how they did it: “The players wanted it badly,” he said. If the powerful Etebo explodes like the stocky Aiyegbeni in Uyo on November 12, Nigeria will win. This is my most recent example. Nigeria were the under-dogs against a star-studded Ivorian side in the quarter final of the 2013 AFCON in South Africa. 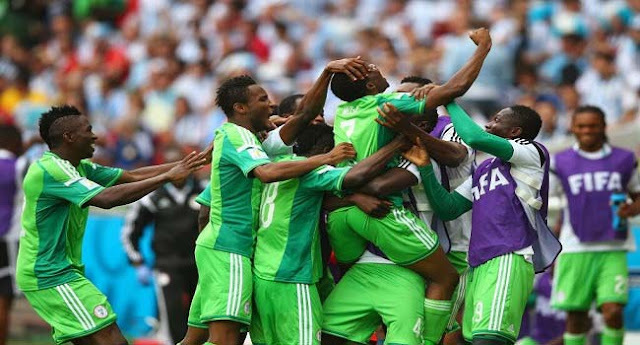 No one gave the Eagles a chance, not even Nigeria Football Federation (NFF) officials. But Keshi and his troops won the game 2-1 and went on to clinch the AFCON trophy. 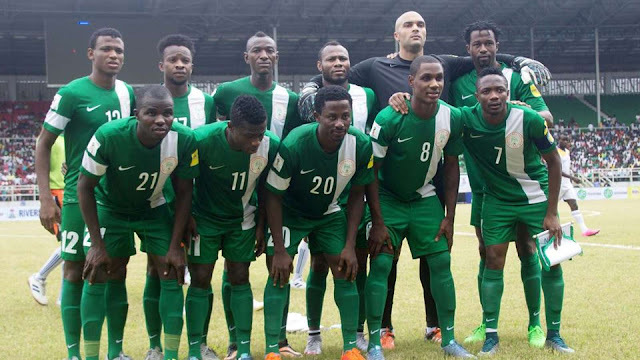 Luckily, many of the players that took part in the 2013 AFCON triumph are still in the Eagles squad that will face Algeria in Uyo on Saturday. Mikel, Onazi, Moses, Elderson Echiejile and Brown Ideye all played pivotal roles in South Africa. A repeat performance of total concentration, tactical discipline, team work and unshakeable determination to win will be enough to give Nigeria victory. Yes, Nigeria will win! NIGERIA and Algeria have played each other 18 times at international level with seven wins apiece and four draws. However, Nigeria has the edge on the goals count with 24 against Algeria's 21. Perhaps the most significant statistic from the Nigerian perspective is the recent clashes between the two African rivals. The last time Algeria defeated Nigeria was in the final of the 1990 AFCON in Algiers. Since then, Nigeria has won five of the last six matches and drawn the other. In fact, the Eagles have won the last four games on the trot. That will be extended to five straight games on Saturday insha Allah! LESS than two months after I celebrated Enugu Rangers' League title win here in this column with some of the Igbo language that I picked up during my National Youth Service year in the old Anambra State, I'm back again to expand my Eastern Nigeria vocabulary. 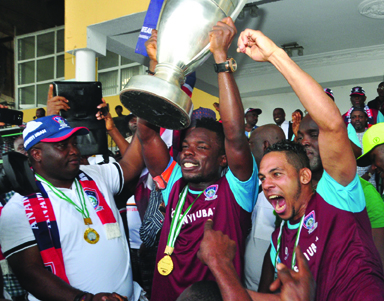 Last weekend at the Teslim Balogun Stadium in Lagos, FC IfeanyiUbah of Nnewi, Anambra State, completed a fairy tale run by winning the 2016 Federation Cup in only the second year of their existence. If you consider the fact that the current Enugu and Anambra States together belonged to the old Anambra State where I served, you will understand why I feel obliged to also congratulate FC IfeanyiUbah in “our” local dialect: “Ndi IfeanyiUbah, Imeela” (You have done well). Both the League and Cup titles now rest in the two sister states, East of the Niger. I'm sure the winner's proprietor, Dr. Patrick Ifeanyi Ubah is simply joyous with the win. Even as I was writing this, our website completesportsnigeria.com editor Nnamdi Ezekute walked into my office to play for me the FC IfeanyiUbah club anthem. Titled “Ndi Nmeri” (The Champions), the song is meant to inspire the players and supporters to be the best they can be. Dr. Ubah has been on a revolution to make the club a model in Nigeria. He is constructing a sports and recreation complex in Onitsha and has entered into a partnership with West Ham United Football Club of England to further advance his dreams. I hope the club's success in the Federation Cup will encourage Ubah to do more, starting with the CAF Confederation Cup where FC IfeanyiUbah will represent Nigeria next year. And I hope that Ubah does not suffer the kind of frustration that forced rich club proprietors such as the late Chief M.K.O. Abiola (Abiola Babes) and Chief Emmanuel Iwuanyanwu (Iwuanyanwu Nationale) to quit Nigerian football unceremoniously. As for Nasarawa United, I say to them, better luck next time. Kudos to you sir for your piece, which I believe spurred the S.Eagles to victory. And kudos to the Technical crew for the victory as well. However, I don’t understand why Kelechi Ihenacho should be deployed as a striker, when it is obvious that he is not one. Brown Ideye should have been made to play that role due to his ‘big’ physique while Ihenacho plays behind him just like they did against Zambia. Secondly, I think Shehu Abdullahi should have started in the right full back position instead of Kenneth Omeruo. The technical crew and the entire team cannot to take for granted, the ‘bigger’ Camerounians, who obviously will be coming for war in Uyo next August. Am also hoping that NFF will assist the technical crew by organizing top quality friendly games so as to fully utilize all the FIFA windows to further strengthen the team since the next game is not coming up until August next year. (1)"Sudan had secured a draw in the first leg in Lagos and ... - The game was played in PH and won 2-0 by the Eagles. The team was under pressure to win in Sudan because we lost 0-1 to S/Leone away. (2)"The Eagles were under pressure having just managed to scrap a 1-0 win over Morocco which caused Lagos fans to hold them hostage". THE EAGLES ACTUALLY BEAT MORROCO 2-0 (IN THEIR 3RD GROUP GAME), NOT 1-0 & THEY WERE UNDER PRESSURE TO WIN THAT PARTICULAR GAME BECAUSE THEY DREW 0-0 WITH CONGO IN THEIR 2ND GROUP GAME WHICH WAS WHAT LED TO THEIR BEING HELD HOSTAGE BY LAGOS FANS. CONTRARY TO WHAT YOU SAID, THE GAME AGAINST S/AFRICA WAS NOT PLAYED UNDER ANY PRESSURE BUT ON A HIGH, THE TEAM HAVING JUST OVERCAME THE STUBBORN SENEGALESE IN A BAD TEMPERED Q/FINAL MATCH. FINALLY, THE GAME AGAINST CAMEROUN IS NEXT AUGUST. THE CHALLENGE IS HOW TO KEEP THE TEAM MOTIVATED AHEAD OF THAT GAME, ESPECIALLY WITH OUR ABSENCE AT THE AFCON. OVER TO YOU SIR!